Follow us here and through the game for our live coverage of the calls and rules interpretations of Super Bowl LII from U.S. Bank Stadium in Minneapolis. This will conclude our coverage of our ninth full season at Football Zebras. Wonder if there was a prop bet on the Patriots offense actually having holding call against them. If that hit on Cooks isn’t illegal, they need to fix the rule. It’s exactly the same hit as an illegal blindside block on a defender by an offensive player. I’d say they seem to be calling, or in this case, not calling, things pretty equally. Quite the opposite of the expectations I read from people going in. Just as I expected, the exact same hit can be a foul in once case but not in another. Just another deficiency of the NFL rule book. Both players, are, in reality, defenseless. Not according to the NFL. Alberto Riveron needs to be fired after the game. He has no business being involved in NFL officiating, much less being the guy at the top. How do you screw up that replay review? It wasn’t even up for debate. As easy of an incomplete pass call as you will see. I’m not surprised at all that he blew it. He should be out of a job tomorrow. Well, another Pats TD off a d penalty. Amazing how that happens every week. Maybe if the “all star” crew looks a bit harder, they might see the eagles outside pass rush being held. Illegal contact on last play by Eagles defensive back two hand shove. Plus roughing the passer ? Clearly incomplete pass on Eagles TD play. Even Sterratore’s body language in my opinion showed He didn’t agree with review ruling. I will say the Ertz play was the right call for a TD. Are you seriously complaining about the officiating benefiting the Patriots? They gave the Eagles two touchdowns. The obvious bobble made the play by Clement incomplete. And there was a clear illegal formation on the Foles touchdown catch. People like to bring up Super Bowl XL as an example of bad officiating. This was worse. The play to Clement in the back of the endzone was clearly bobbled and not controlled in-bounds. There was a clear illegal formation missed on the Foles TD play. The Clement play occurred on third down, and presumably the next play would have been a 40-yard field goal attempt by the Eagles. So this missed call, ultimately by Riveron in New York, gave the Eagles 4-7 points. We don’t know if the field goal would have been made. The Foles play was on fourth down, so I think we can assume that they would have attempted the field goal from the 7, and the odds are heavily in favor of him making it. I’d call this a 4-point error. But it’s an egregious error. The Eagles were actually closer to having five on the line than they were to having seven. Obviously we don’t know how the game would have played out differently, so we can’t truly state the impact of the misses. And for the record, I believe the Ertz call was correct. I do believe the fact that the current rule supports that being a catch and the Jesse James play not being a catch is a problem, and hopefully they will properly address that in the offseason. Both were players who clearly controlled the ball lunging into the end zone. If you want to really be technical, you could argue that James survived his initial contact with the ground, as he was already on his knees, prior to lunging the ball over the goal line and then losing control momentarily. Ben, your statement on the out-of-bounds / maybe progress was stopped play is absolutely ridiculous. Lewis was born too early the man was still moving forward a b stop stop stop is in the whistle it’s not a ruling that a decision has been made and wait for it to you out of your mind show me that in the rulebook Ben. Also when you try to defend these referees so much you lose all your credibility. When they got picked up the boy he was three yards in Bound I have no idea what you’re talking about. Waltcomeon, you lose all credibility when you say “I don’t think it’s a touchdown” and then say they should call it a touchdown after review. Well, like it or not here we are again with a big penalty beneficiary discrepancy in the Patriots favor – what a surprise. That a net +30 yards for NE. NE apologist will claim NE just play a cleaner brand of football and at the league deflectors that run this website claim today’s crew was even handed and judicious. The reality from where I sat was on a few critical close plays in the game the refs threw flags that favored NE. I thought the false start on PHI and the early hold on Gronk were good calls. The later hold on Gronk was all acting by Gronk and the other D hold on PHI that Hogan picked up on the critical third down after the INT was bunk. The mind blower in my opinion was the 2 pt conversion that was clearly DPI but the refs swallowed their whistles for NE as usual. And pick any of about five offensive holds on NE but not a one called and there where by my count three clear pushed in the back by the NE offensive left tackle. The foul for holding Hogan was made because he clearly grabbed and turned him. 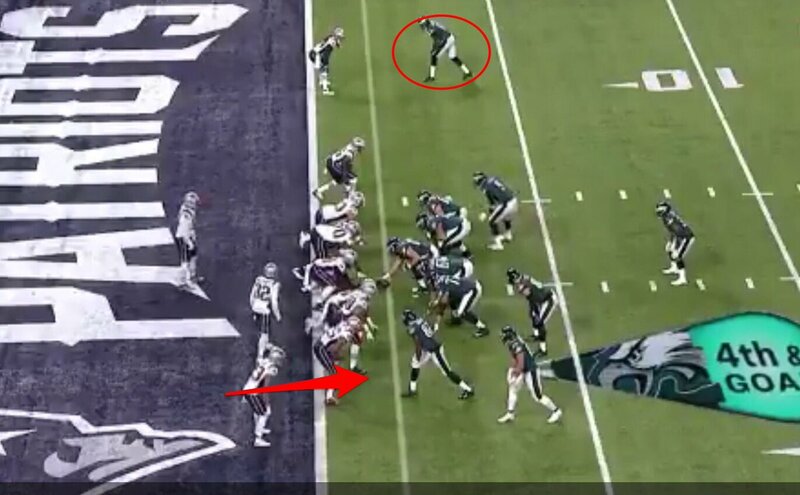 You don’t mention the clearly illegal formation on the Eagles on Foles’s touchdown catch. That was the biggest miss of the game, and that’s an objective fact not open to interpretation. The Eagles indisputably had five players at least two yards off the line. In my opinion, the game was largely well-officiated. Unfortunately the two calls missed, the illegal formation and review allowing Clement’s bobble to stand, overshadow an otherwise solid effort from the officiating crew. One penalty for 5 yards on the Patriots for the entire game? One? Really NFL? OK, let’s say the officials “put the flags away” for the Championship game? I’m fine with that. But that’s not really what happened for the Eagles, most notably the questionable DPI call that kept the New England drive, after the second quarter interception, alive. A drive that instead of a punt turned into an important TD for the Patriots. That’s the kind of call that goes New Englands game, week after week. Then on the other side of the whistle we see the obvious DPI committed by the New England defender on the Eagle WR in the end zone on third down, the play just before the Nick Foles TD catch. That should have been called against the Patriots, but was let go by the referees. It should have kept the Eagles to a FG instead of first down at the goal line. Instead, the Eagles pull off a trick play to score the TD anyway. Lesser teams, however, would have succumbed to that bad officiating. And those four points that would have been the swing on that “non call”? Would have given New England the win in a close game. And then there was the other obvious no call on the two-point conversion play where the New England defender clearly is pushing the Eagle player backwards before the ball arrives. That’s a 9 point swing right there which could have been an 11 point swing had the Eagles no responded on fourth down and scored a TD anyway, on the Foles catch, instead of kicking the FG. And that’s just on three calls, all of which went New Englands way. The offensive line holds that are never called, the constant pushing off by Gronkowski that are never called, the DPI calls that are seldom called against New England defenders, it’s death by a thousand slow cuts, not just the obvious reversals of TD catches like in the Steelers and Jet games, that make New England the dynasty they are. One penalty for five yards? One? Come on. That’s how New England wins close games, against the Steelers, against the Jets, against the Jaguars. Few and inconsequential penalties called on New England, critical, timely, and costly penalties called against their opponents. So ends the sad and pathetic NFL 2017 season. Hbk. That is right i dont think Clement play was a td but it should have stood because it not clear and indisputable. That is the standard under which all.reviews must be judged. So if I see that play myself as a de novo review incompolete. But giving adequate deference to the call on the field the play stands as called. Also stop with the illegal formation. Nevercalled ever. Biggest miss of game was 2 point coversrion PI on last TD of the game. Didnt look back and got there early. Called 95% of the time. Vanowensbody: And yet you conveniently leave out the part where the Eagles got away with an illegal motion penalty on the Foles TD catch, the part where an incomplete Eagles pass was allowed to stand for a TD both on-field and in replay, and the part where the Eagles got away with some sort of illegal contact on the Hail Mary attempt (away from the endzone & thus should’ve been called). You’re a hater blinded by your own jealousy to see that the officials actually cost the Patriots opportunities this time, not the other way around. Walt, the one to Clement, if that’s the one you’re referring to, could have been called. I think it would have been weak. It was still very catchable. There’s also no guarantee the Eagles score on a retry. The two Eagles plays I mention below would have resulted in fourth down, and short of Doug Peterson losing his mind, both result in field goal attempts. Even if they make both, that’s still an eight point swing. The Clement play was clear and indisputable. The view wasn’t obstructed. It was clear as day that the bobble constituted a lack of control and that the pass was incomplete. The illegal formation was an inexcusable miss. It’s not like he was slightly off the line. The Eagles had five players 2+ full yards off the line. That’s egregious. Overall the referees let the players play. They call very few fouls on either team that were subjective. You can argue they let them play too much, but I don’t think you can argue a significant bias in calls either way. The obvious call they missed against the Eagles just happened to result in a touchdown. That was compounded by Al Riveron, who should have found himself out of a job this morning, blowing the Clement replay review. Show me irrefutable evidence that the ball was not in full control. Please remember switching hands is control. I saw the all 22 yesterday on the trick play the guy looked over to the official and got two thumbs up. And if you don’t think if that’s pass interference on that two-point conversion in the modern NFL you are there delusional or an out fraud. You’re very short-sighted man John. Do you remember what that replacement ref Larry said on the correctly called Fail Mary the NFL says no pass interference on hail mary plays.